Calling all residents and businesses within Barnes SW13 searching for a man and van service. we have a selection of vans for you direct to your front door. In our vans we offer a smarter and cheaper way when it comes to a home or office removal service. We move home belongings, any type of furniture or white goods including fridges. All areas local to Barnes, London are served and no job is too much effort. Take advantage of our helpful driver too and save yourself half the effort, we are happy to help load at no extra charge. For smaller moves we have smaller vans in Barnes so if you are a house or flat sharer with just a few bags and boxes then save money and with us and go for a suitably adequate vehicle to suit your needs. Barnes is one of our preferred towns in South West London, we have built a good reputation in this area and we want to keep it this way. What ever you need to relocate think of us, it's what we do and always on hand to assist. Yes Barnes and it's folk are great and wonderful to be around. We have been working here for many a year now, so much so that it has become almost like a second home to us. Nothing suits us better than to be on familiar territory sorting out our customers transportation needs. It's amazing the things we have been asked to relocate and they vary immensely from a baby grand piano to a clients full photographic studio. 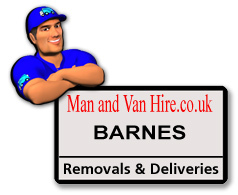 Indeed there are many similar man and van services around Barnes, there has never been a time were providers such as ourselves have been so abundant! This is good for you the customer or is it? Well it doesn't take much for anyone to buy or borrow a works a van and start advertising a service. We get at least half a dozen calls a month from people who have been let down by less professional van men and in a blind panic to find a replacement at the last minute. We hear this all the time and it's always the same story, customers have told us they were quoted a ridiculous cheaper price and so booked with them only to be let down. Why does this happen? Who knows but more than likely due to over booking, It easily happens. Men with vans who quote dirt cheap prices usually have a slot to fill between jobs and do not allow for other jobs taking longer than planned, there just isn't enough time in the day to fulfill all their obligations. We appreciate the need to turn up, be on time and above all carry out our work in a professional manner. Your booking with us is set in stone, no way will we risk our good name and reputation and take on more work than we can handle.